The late, great Katharine Hepburn remains my favorite actress of all time. I loved her in virtually every film role she ever had thanks to her incredible style, honest wit and often cantankerous spirit. So entering a one-woman show devoted to her instilled me with a brief sense of trepidation, wondering how any actress could adequately portray the woman who arguably was the singular best actress of the 20th century bar none. 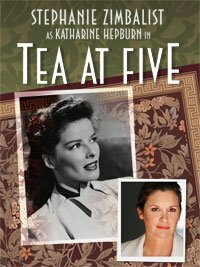 During the first act of playwright Matthew Lombardo’s surprisingly revealing look at this grand dame in Tea At Five -- now touring the country -- I was struck by how much actress Stephanie Zimbalist reminded me of an actress that I loved from my childhood. Unfortunately, the actress I was reminded of was Lucille Ball in her latter days as Lucy Ricardo -- you know, the Lucy dating from the episodes when the Ricardos and Mertzes moved to Connecticut. Sure, Zimbalist may have mimicked the voice of Hepburn, but I saw red….Lucy red. That’s too bad considering the wonderful voice Lombardo provided to Zimbalist’s younger Hepburn from her heady days immediately before her “comeback” via “Philadelphia Story.” The actress was considered a has-been flop, and in her Connecticut home, we see Hepburn hoping beyond hope to be cast as Scarlett O’Hara. Along the way, we learn of her romantic dalliances, marriage, abortion and several other issues that left her fodder for the gossip columnists of her time. But most of all, we see the self-doubt that enveloped the once and future great actress (she had already won one Academy Award for “Morning Glory” and would go on to win a record four more throughout her lengthy career). Fortunately, Zimbalist overcomes the Lucy look in the second act when she so accurately portrays Hepburn in her twilight years -- set 45 years after the first act. Here, Zimbalist is Hepburn, not only in voice and spirit, but also amazingly in appearance. This most private among stars candidly discusses her family history of suicides and stoicism that helped shape who she was, along with an inside look on her 27 years with the married Spencer Tracy. Here we see the great actress, still full of vim and vigor, yet all alone. It’s fair to say that no mere mortal actress can take on the storied role of Katharine Hepburn, and it certainly didn’t help that Zimbalist had to win over her audience. But once she did, especially in the second act, you believed you were actually witnessing Kate the great. And that’s no small feat. Were London Critics Mourning West End Wicked?